NOTE: First published in 1989 by Falken-Verlag GmbH 1989. English translation by John Littlewood. COVER: Backgammon is one of the most popular and enduring of all board games and is currently undergoing something of a revival of interest. Suitable for all ages and levels of ability, backgammon can be seen as an amusing leisure activity, a fierce competitive struggle or an absorbing and satisfying intellectual pursuit. This comprehensive handbook, the most detailed study available, covers every aspect of this fascinating game and will be ideal for beginners, enthusiasts and serious addicts. The rules are fully explained, game strategies examined and for more advanced players the authors include a selection of match situations to test and challenge the brain. Over 350 board diagrams illustrate the text, so allowing the book to be easily understood without reference to a board, and making this the ideal companion for all backgammon players. Backgammon can be played as an enjoyable game of chance or an intellectually challenging contest of strategy. It has fascinated players for over five thousand years and is increasingly popular today with people of all ages. 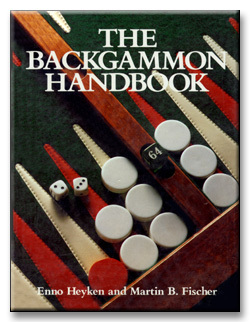 The Backgammon Handbook is the most comprehensive study of the game available. AUTHORS: Enno Heyken was born in Hamburg in 1959. For his thesis in psychology he explored the development of interest and performance in chess players. Awarded the Internation Chess Master title in 1987 by FIDE he has also made a name for himself as a leading chess journalist. Since the beginning of 1989 he has been working on the development of the first backgammon computer program to attain world-class level. Martin B. Fischer was born in Hamburg in 1962 and studied law at Hamburg University. As a tournament chess player he too carried out intensive research into chess training methods, before participating successfully in numerous backgammon tournaments. Both authors have been involved for some years now with the theory and coaching of backgammon and currently offer courses on the subject.